Back Porch Makeover That Is Simple, Frugal and Full Of DIY Projects. 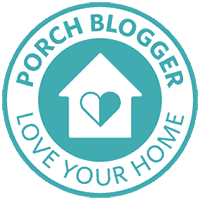 It is Back Porch Reveal day!!! Whoop! Whoop! I think I am more excited about this reveal than any other reveal. 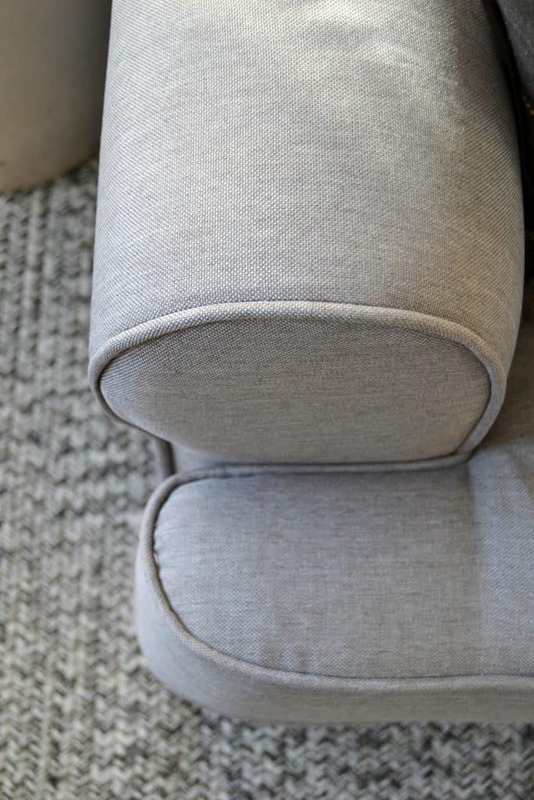 We have lived in our home for fourteen years and our style and needs have changed just like anybody else’s, but through my blog journey, I feel like I have really been pushed to grasp what my style is and the direction I want it to go. It is exciting to go through that process and I am enjoying every minute of it. Our back porch has come a long way in the past few months. Like all of our makeovers, we DIY’d all of it and worked with a small budget. The hard work paid off! Our back porch is all grown up now and I am thrilled to finally be sharing it with you. Let’s start out with a couple of before pictures. The first thing we did was give the entire porch a fresh coat of white paint. I chose “Picket Fence” from Fusion Mineral Paint. It is a crisp white that made the porch brighter and more airy. 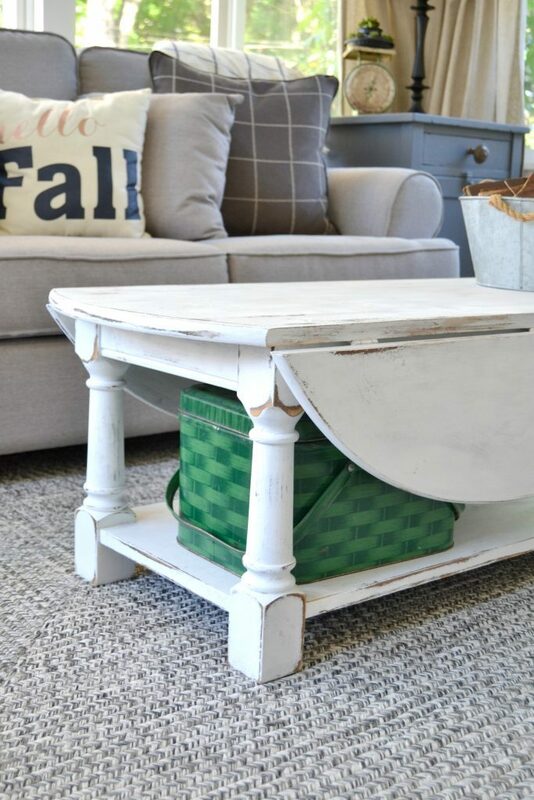 I am always amazed by what a coat of fresh white paint can do to a room or piece of furniture. 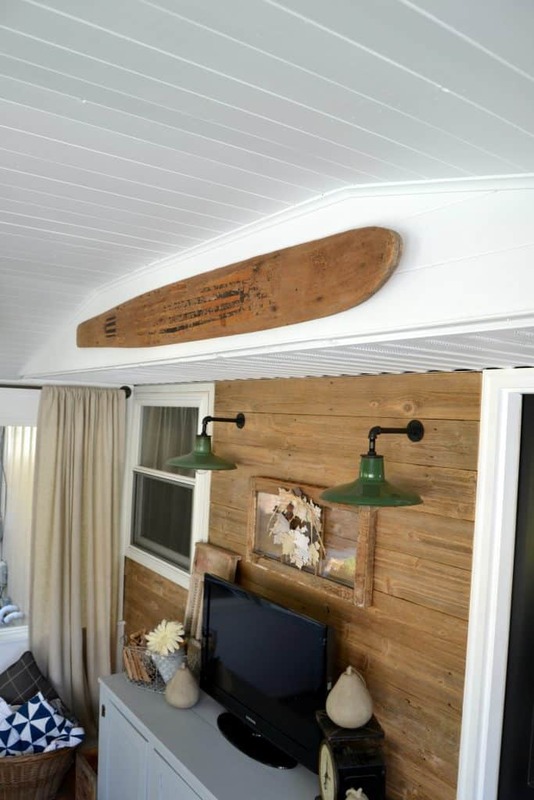 Having the crisp white paint on both the ceilings and walls makes the porch feel bigger and less choppy. We added windows to all three sides of our back porch so there isn’t a ton of wall space for paint anyway. Adding the white paint to the ceiling keeps your eyes moving and makes the porch feel more open. 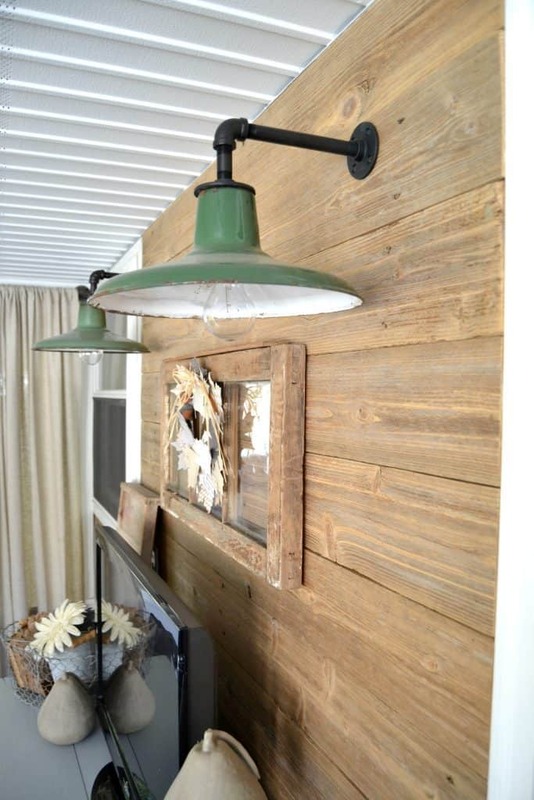 Once the paint was done, I couldn’t wait to tackle the FREE reclaimed wood wall and farmhouse lighting. I will be sharing those projects later this week and next. Stay tuned. You won’t want to miss them. After the paint, reclaimed wood wall and lighting, we needed to pick out new flooring. When we first added the porch on the house, we just laid a gray carpet down to be done. We knew it wasn’t the long-tern solution but would work until we did this makeover. Our back porch sees a lot of traffic. A lot. It is the entry we use every day. 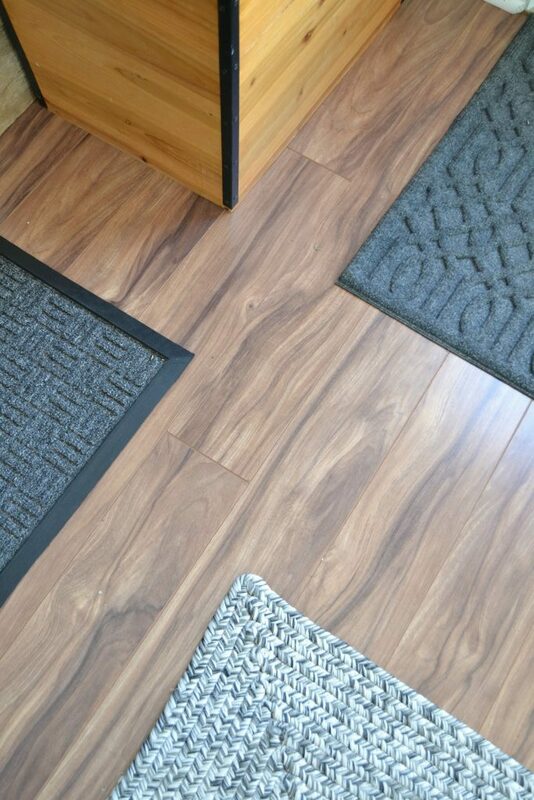 I wanted to add a laminate floor so it not only looked great, but was easy to clean. We spent a few hours at Lowes and decided on Allen and Roth Laminate Flooring. While we were at Lowes, I found new rugs for the doors in the porch. We were in dire need of new rugs. Like I said, we use these doors every day so our old rugs had seen better days. 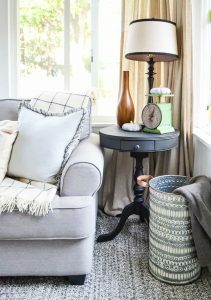 The rugs I chose aren’t too big and match the color scheme, but even better, they collect a lot of dirt the kiddos bring in on their shoes. My next big decision was the rug for the center of the porch. I am going to be totally honest here and say that I get a little hesitant shopping online because I can’t be certain it is exactly what I am looking for. So, when I am shopping for certain things online, it takes me longer than usual because I want to make sure it is the right choice. 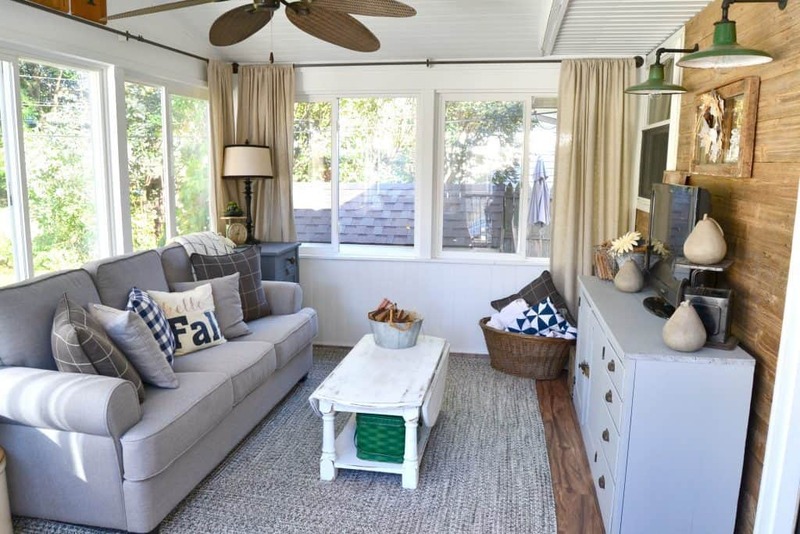 For the porch, I wanted the rug to be comfortable, pretty and the right size. I wanted it to soften the laminate floors and yet be cozy enough to sit on when we spread out on the floor. After much back and forth, I chose the Jubilee Braided Rug from Rugs USA. It was just what the rug doctor ordered. This rug is super comfortable and so soft. 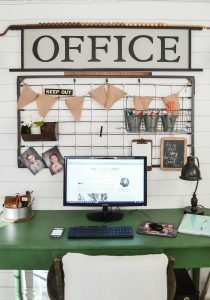 It has many neutral colors in it (gray, white, greige, black) that will fit my ever-changing decorating. It is big enough that we can spread out on it. The only draw-back was that it was sliding a lot on the laminate flooring. I remedied that with a rubber rug pad from Lowes and now it stays put. 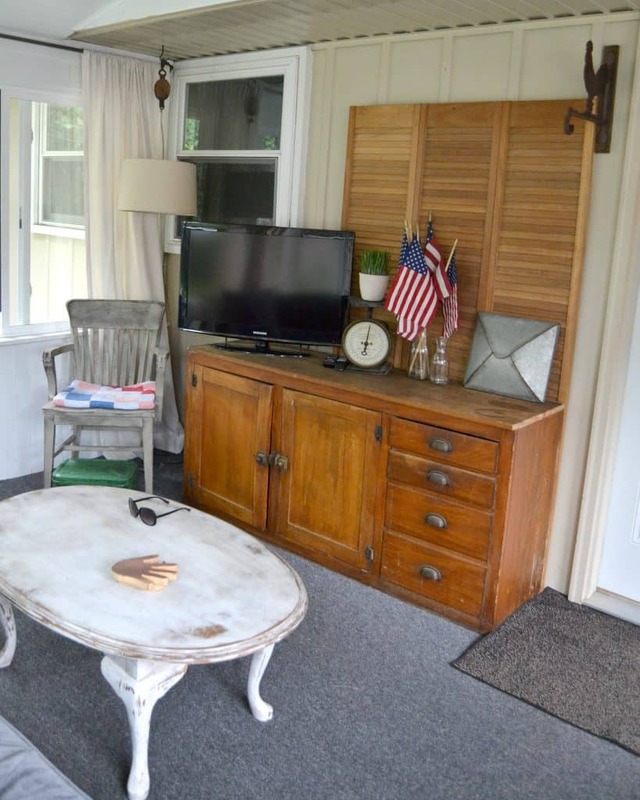 As we were going through this porch makeover, everything just came together. A big help in that was doing the makeover during yard sale season. 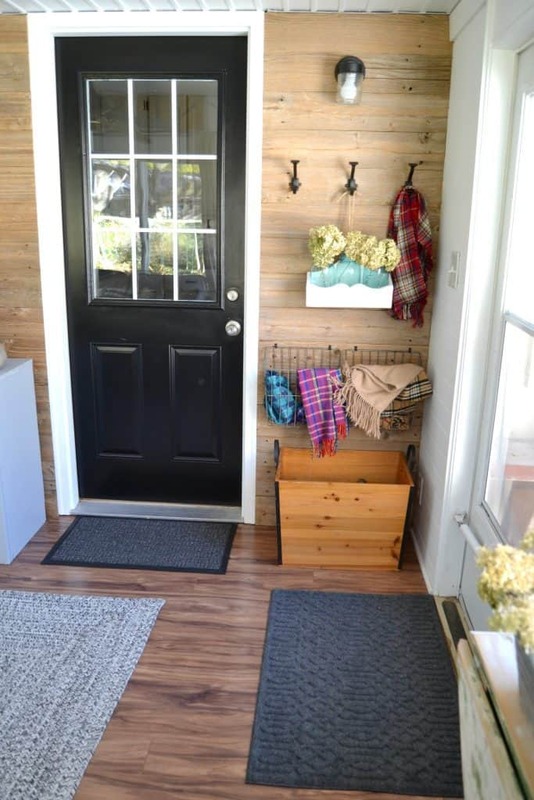 I found great things to add to the porch without breaking the bank. 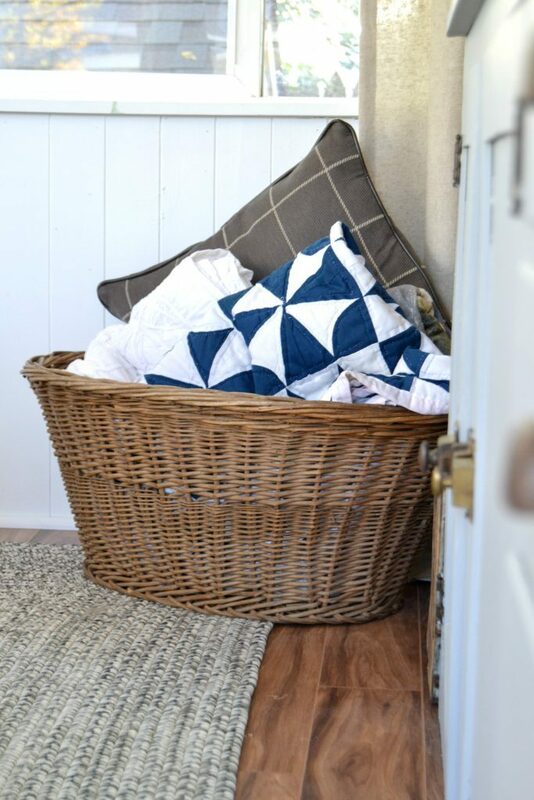 An old, wicker basket is perfect for holding blankets and extra pillows (which are a must in a back porch). The coffee table was a $5 yard sale score that I made over to fit the room. We need a narrow coffee table for every day, but when we are playing a game or eating a snack, we need more table space. This coffee table has drop down sides so it fit our needs PERFECTLY! I wanted to change out the curtains in the porch, but didn’t want to spend the money. I found a yard sale where the lady was redecorating her entire house. I got four Target curtain panels in an “oatmeal” color for $5! The other odds and ends you see placed around the porch are yard sale finds too. 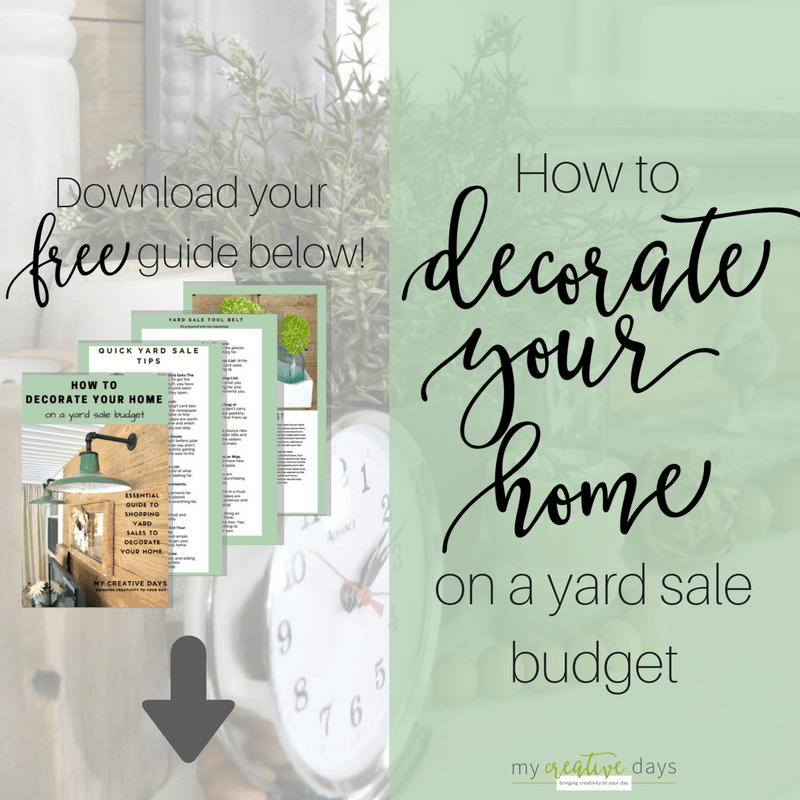 There is nothing better than heading out to yard sales with an actual room or design in mind. Last, but not least, was a new sofa. This was another tough decision for me. 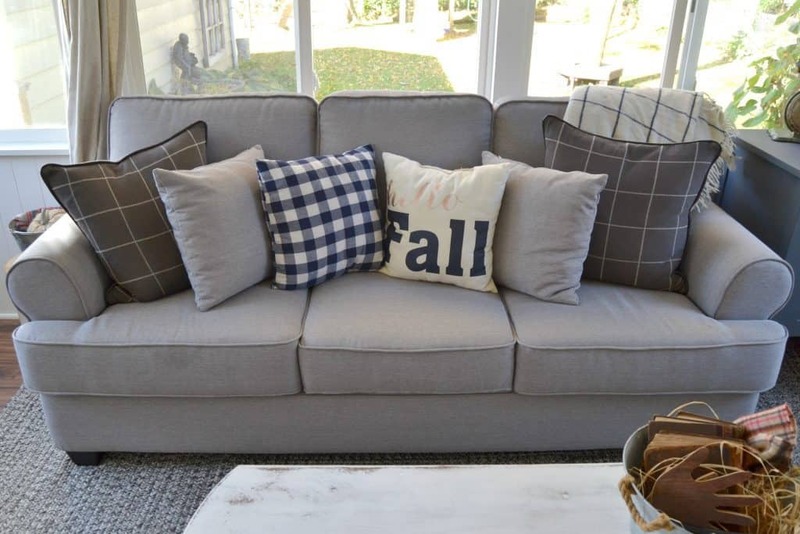 I have seen so many great white and cream sofas that I knew would look pretty in our porch, but Matt insisted that a white sofa was not what our porch needed. He knew I would be worried about what the kids were spilling on it all the time. He was right. 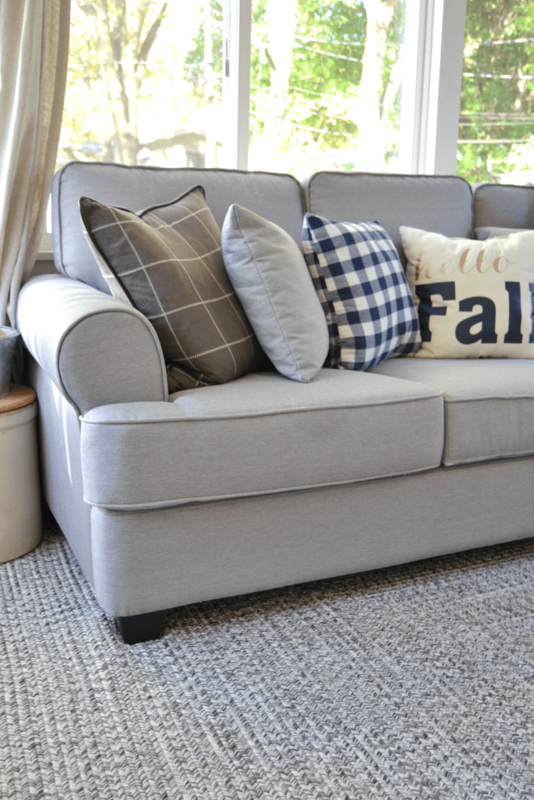 I used a gift card from WayFair and finally chose the Classic Plush Sofa from WayFair. Again, I was a little worried about this purchase because I wasn’t able to see it or sit in it before I bought it. When it was delivered and we started opening up the box, a pillow popped out. Phew. My worries were put to rest. I loved the fabric more in person than online. And, the color was perfection for our porch. 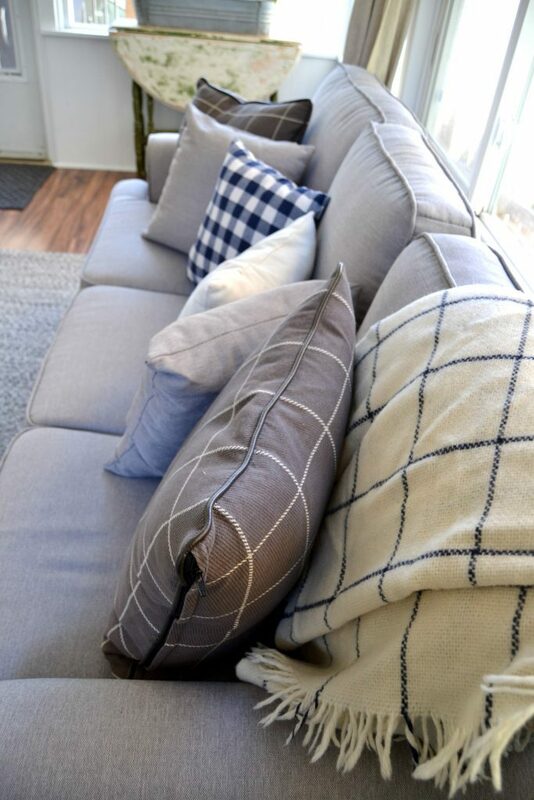 The sofa has a “tailored-linen” look to it. (Humor me and tell me that is a technical term). It is casual yet serious. Traditional yet trendy. The sofa could not have been a better fit for the porch. It is not too big, not too small. 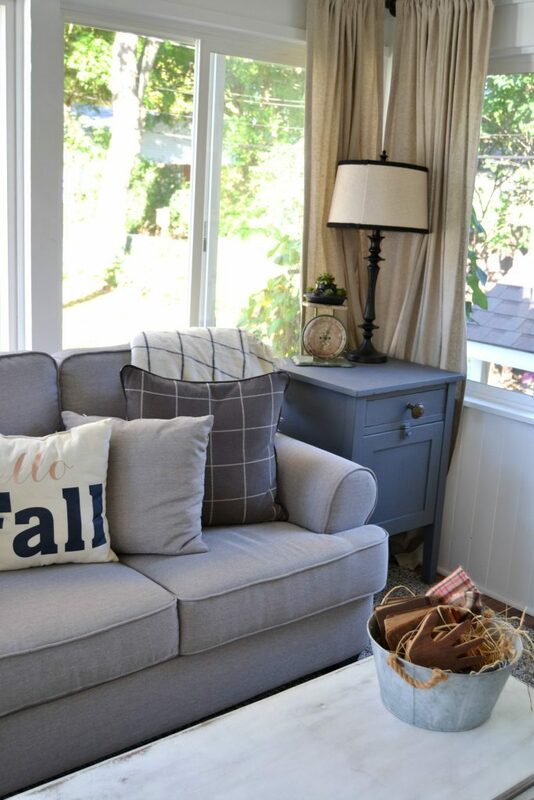 The color is neutral so I can change the throw pillows all the time. Just think of all the throw pillow possibilities. Opposite the sofa is the amazing reclaimed wood wall and the piece we set a our TV on. We rescued this cabinet from a garage. It housed a bunch of oil cans and miscellaneous garage stuff in its former life. When I first put it in the porch, I didn’t think I would paint it. Then, as we were working through the makeover, I knew it would fit better if I painted it. I mixed a few gray and white colors from Fusion Mineral Paint to come up with the custom color for the piece. Now, it really stands out and is so much more than a TV cabinet. I can’t believe I made it to the end of this post. This makeover is done. I am still searching for a chair or two to add to it for more seating, but the main projects are done. 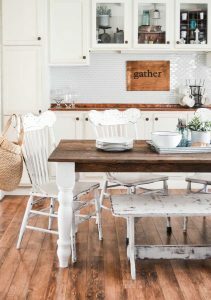 I split up a couple of the projects we did in the makeover to other posts so I could give them more attention and you can really see how we did it. This porch is truly a happy spot in our home and I am glad we finally gave it the attention it needed. 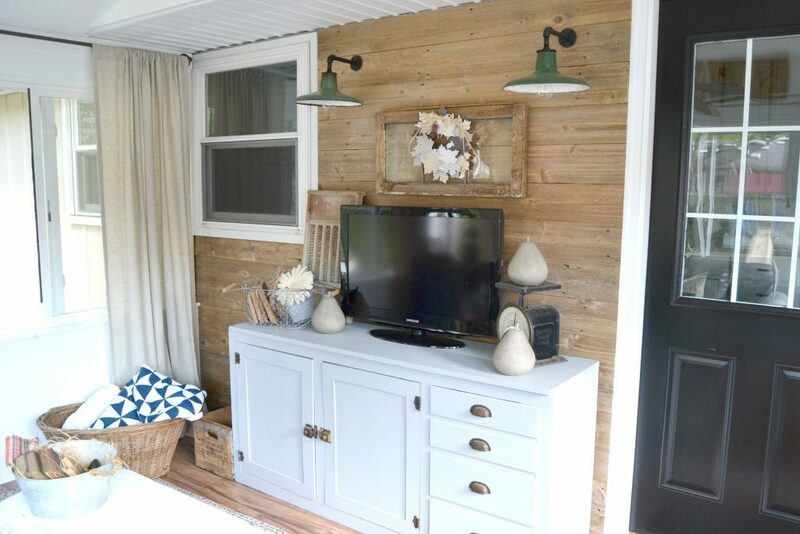 What is your favorite part of our back porch makeover? What do you think made the biggest impact? See the source list for the porch below. 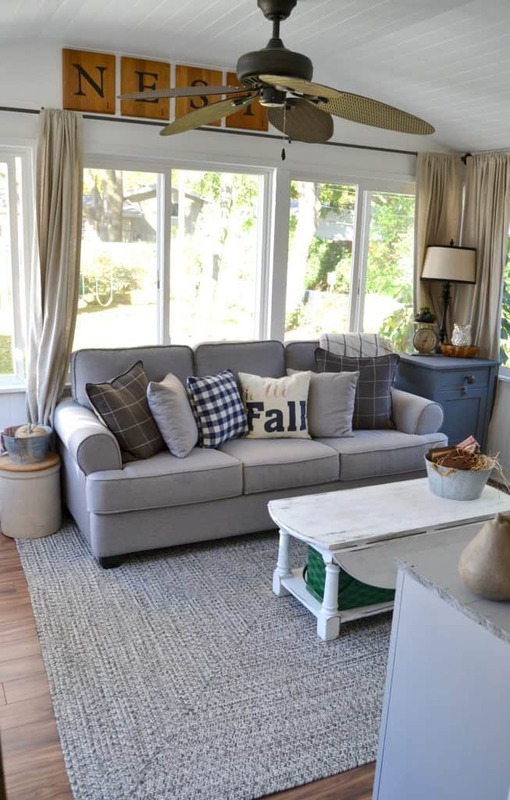 Love the couch, the coffee table, the rug, the curtains, the garage cabinet…and the wondows! It all ties in together very well. Love the redo, Opens up the space and looks fantastic! Looove it! Wow Lindsay you guys did it! It does look airy and bigger, yet cozy and inviting! I wish I was in the vicinity, I would stop by for a cup of hot tea and a bit of chit chat!! IS THAT A FOLD UP TABLE IN THE BACK GROUND OF THE SOFA PICTURE? DOES IT FOLD FLAT OR DOES IT HAVE ABOUT A 4 IN. TOP WHEN FOLDED DOWN? LOVE YOUR ROOM. Yes, that table does fold up on both sides. The top is about 6″ when the sides are down. Thank you! Wow! That looks great! I love those lights and can’t wait for the post on them! 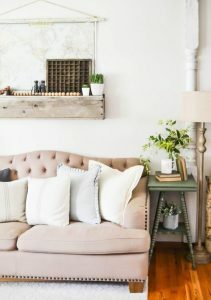 The sofa is seriously gorgeous and the coffee table-what a find! Y’all did good! 🙂 Great makeover! Whoa. What a fantastic update! 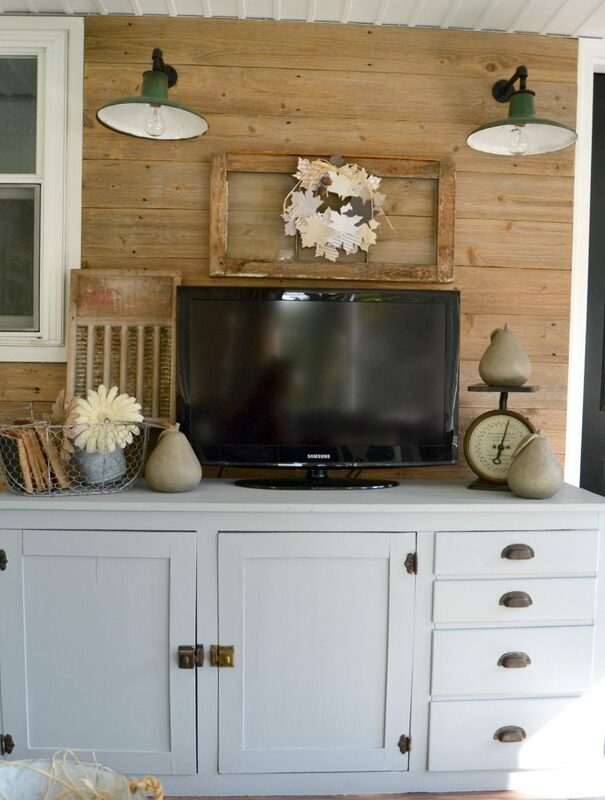 I love all the little touches and the big ones too (like the sofa and the painted tv stand). Great job! I love your back porch it is too pretty. 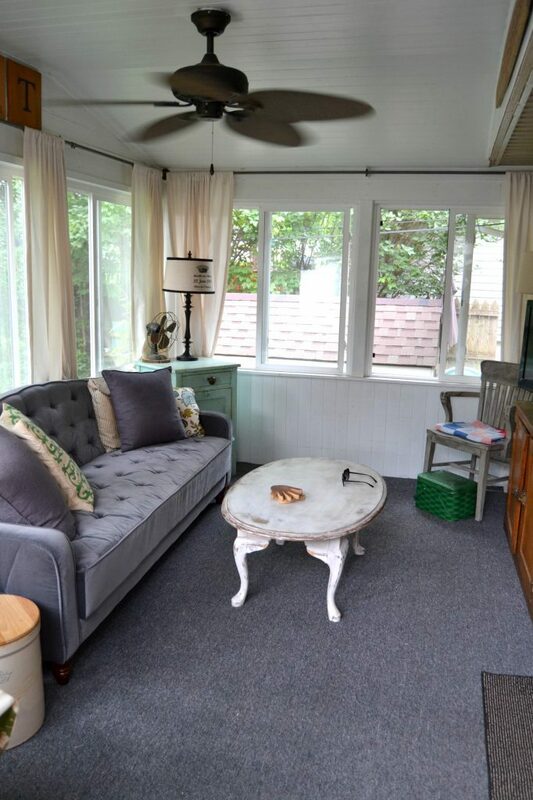 We have a huge sunroom on the back of our house that has become a junk room I was just telling my husband it is ashamed to let the room come to this we made a promise to bring it back to its days where people would say it looked like it belong in a magazine. Looking at your room gives me inspiration to start on my back porch. I really enjoy your post. Thank you! Yes, go for it! You won’t be sorry you did! Send me photos!! I love your porch room. It looks so bright, airy and cozy! Great job!